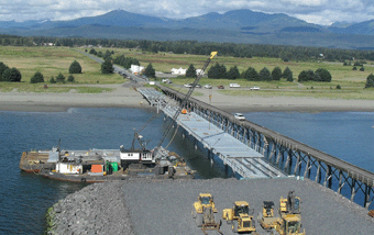 In April of 2011, the contractor who was constructing the new replacement causeway for the City of Gustavus, Alaska needed to procure large, custom tie-rod assemblies for the project. The tie-rod assemblies were specified as 1-1/2” diameter hot dip galvanized steel and varied in length from 43’ to 53’overall. The contractor trusted Portland Bolt to manufacture these custom assemblies and utilized our tie-rod calculator to help determine the necessary clevis and turnbuckle sizes, as well as the appropriate rod lengths. Like many Portland Bolt orders, this project was on a time critical delivery schedule, due to the logistical constraints involved with barge transport of the assemblies to Alaska. Because of these constraints, it was critical that the entire order be manufactured and shipped on time. As promised, the order shipped on time and allowed the contractor to keep the project on schedule. The causeway replacement project will consist of replacing the existing timber dock and approach with new steel structures that are capable of providing roll-on/ roll-off transfer for public transportation and freight. The existing dock will remain in place until the new dock is completed and the transfer bridge is on-site and ready to set. The new dock and approach will be open grate decked W beam structures supported by galvanized steel pipe piles. The dock will also incorporate a wave barrier feature to protect the floating transfer structures from the seasonal wind and waves coming off Glacier Bay. Portland Bolt manufactures, galvanizes, and inventories a variety of bolts and specialty hardware for the construction of marine facilities of all sizes. Portland Bolt provides fasteners for projects ranging from small residential docks to multi-million dollar commercial marine projects all over the world.